There are a lot of great coffee places currently popping up in Cologne — this one is definitely my favorite in Lindenthal and my favorite place to read a newspaper for that matter. Coffee aside, the light of this place illuminates it brightly and amazingly. 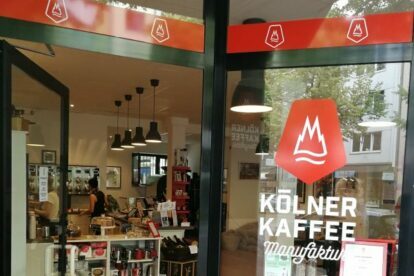 The smell in Kölner Kaffee Manufaktur is exquisite. This is because the roasting happens right within the cafe. You can hear and see, smell and taste the coffee at the same time. The service’s expertise is amazing, and even if you already know a lot about coffee, I am sure you will learn something new, even if that’s only about the taste. If you don’t want to buy coffee to brew at home and just want to enjoy a cup of delicious coffee as a treat, you can drink it right here or order it to-go. If I order a coffee to go I always make sure to bring my reusable cup. If I don’t own one or if I forget to bring it, I can buy one here as well for just 1€.